Colorado – 22nd most populous, the eighth most extensive, and the highest in average elevation of the 50 United States. Colorado is one of the western Mountain States. The 30 highest major summits of the Rocky Mountains all rise within Colorado. The Territory of Colorado joined the Union as the 38th state on August 1, 1876. A satellite image of the Rocky Mountains in the state of Colorado. 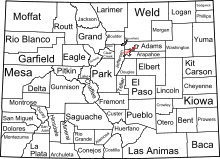 There are no township governments in the state of Colorado. ^ "U.S. Census Bureau State & County QuickFacts". Archived from the original on 2016-02-19. ^ "Mount Elbert". NGS data sheet. U.S. National Geodetic Survey. Retrieved 2009-05-05. ^ "Longs Peak". NGS data sheet. U.S. National Geodetic Survey. Retrieved 2009-05-05. ^ "Pikes Peak". NGS data sheet. U.S. National Geodetic Survey. Retrieved 2009-05-05.